This week saw the public release of Moodle 3.2, with a focus on accessibility and user experience. We’ve spent some time getting familiar with and testing the new version of Moodle, and we’re really impressed with some of the new features which have been introduced. 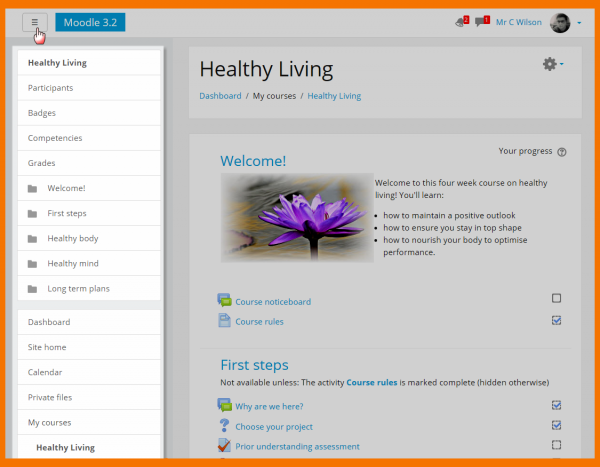 The most obvious visual change to Moodle 3.2 is a brand new core theme called ‘Boost’. 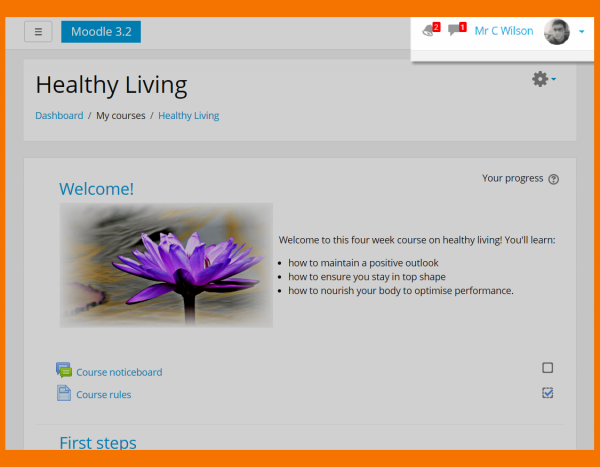 This is a massive improvement to the user experience of Moodle, giving sites a much cleaner, less cluttered look by introducing a collapsible menu system which takes the place of the navigation and administration blocks. The new look brings the desktop site closer to the Moodle mobile app experience and gives more screen real estate to the page content, with the menu options available when needed in a single click. Importantly though, existing Moodle themes will continue to be supported, so users can migrate to the new interface at their own pace. One of our favourite new features in Moodle 3.2 is the ability to create user tours, basically a guided walkthrough of a course which incorporates pop-up windows directing the user to specific features or explaining how to navigate to a relevant area. As well as creating their own custom tours, administrators have access to a repository of tours already published by the Moodle community, which can be imported directly or used as templates for new bespoke tours. Tours can be restricted to specific audiences by role, allowing administrators to create personalised tours for specific groups of students according to ability, or separate versions for staff. An overhaul of the messaging and alerts system in Moodle 3.2 brings it more in line with the kind of user experience we’ve seen on smartphones and social media platforms. New notifications and messages are now highlighted in a messaging menu at the top of the screen, with a count of the number of each yet to be read. Users can click the menu to see a drop down with the new information, without having to navigate away from their current page. Moodle 3.2 includes an updated media player: Video.JS. The new media player allows a greater range of video and audio formats to be embedded in Moodle, with advanced options including multiple video sources for cross-device compatibility, adding thumbnails, captions and subtitles and defining controls, looping and autoplay. A new graphing tool is now available, producing simpler and more attractive graphs and charts which allow individual data points to be displayed as tooltips, reducing on screen clutter, or accessed via a table in a single click for accessibility. Graphs are also fully responsive, resizing to fit a range of devices without distortion. For a more detailed look at the new features in Moodle 3.2 check out this page on Moodle.org, or watch the overview videos on Moodle’s YouTube channel. 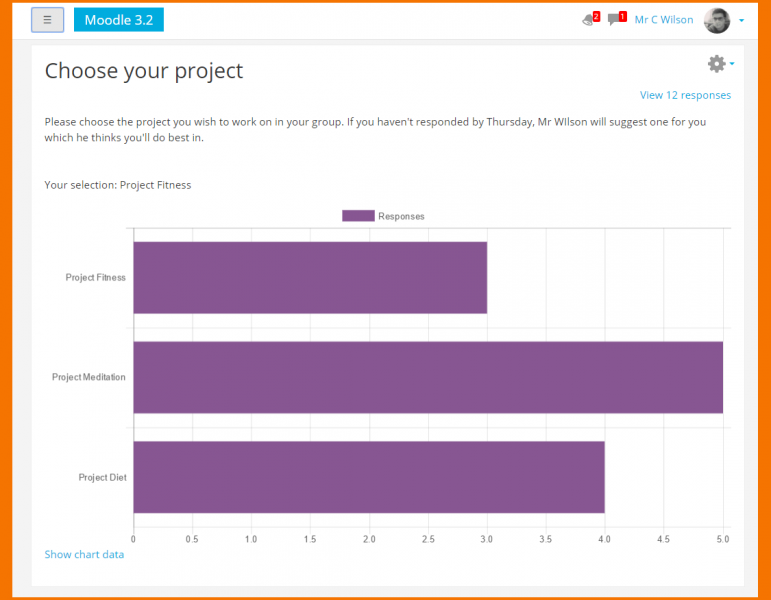 If you’re interested in upgrading to Moodle 3.2 or want to find out more about the new version, please get in touch.